High-quality, high-performance headset brings your PC calls and music to life. Simply insert the USB Headset H540 and instantaneously experience crisp, digital stereo and more crystal-clear calls. With the plug-and-play USB connection, you'll experience crisp, digital stereo and more true-to-life calls almost instantaneously. Laser-tuned drivers and a built-in EQ deliver superior, unrivaled audio quality and rich bass - so you can maximize your listening experience. Enjoy volume and bass level control as well as the ability to instantly mute the mic at your fingertips. You'll never talk with the mute on again thanks to the easy-to-see mute indicator light. Soft leatherette padded headband and earcups allow you to talk or listen in comfort for hours on end. The adjustable microphone reduces background noises for crystal-clear chatting. 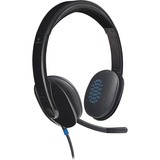 Headset works with games, movies, music and common calling applications and is compatible with Windows and Mac OS. Cable is 6'.